Devourers In the Mist: A rugged adventure tale in which the survival of island castaways is tested not only by the elements - but by the twisted shapes of half-seen, sadistic entities who haunt the atoll's jungled interior! Shanghai Bullets: Guns-blazing danger portends and international intrigue unfurls in the city of conspiracy, the licentious, opium-infested Berlin of the East. In the shadow struggle between nations, no weapon is more fiercely coveted than the star mirror. It brings blood-draining death from beyond the stars! Death Laughs Last: When Philanthropist and gadabout Addison Bright is found bizarrely murdered in his own New York mansion, only a team of doughty investigators can protect his reputation - and the sanity of mankind - from the awful truths lurking in his tragically colourful past. Dimension Y: A scientific experiment yields the promise of a glimpse into an adjoining reality, a repository of man's dreams and memories. But when the heroes peer through this window... they find cosmic horror peering back at them! A bang resounds above your head - the basement door slamming shut. You're trapped in the crypt of impossible pulps! 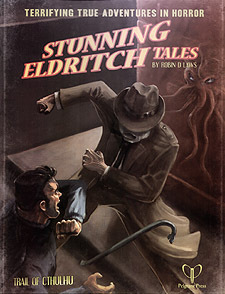 But before you meet your deserved fate, you can take your final pleasure in this collection of exciting pulp-style scenarios for TRAIL OF CTHULHU, the GUMSHOE game of Lovecraftian investigative horror.